So, I wanted to go to a cafe, yes, where girls smile at you. Yes, the ultimate one is needless to say that maid cafe in Akiba! So, I went to Akiba with high expectations that they would be far better than Starbucks. As my maidology study tour, trying to emulate our Anime Diet maidologist The Paper. In Akiba, alas, there were so many maid girls in Akiba passing flyers to us lonely otakus walking down the street day-dreaming imaginary girlfriends (2D girls) in our heads. As passed Central Avenue, suddenly girls with maid outfit appeared a lot and grabbed my attention. And ohhhhh, they were so cute. Japanese girls are usually very slender and tiny, so that also enhances fluffiness of maid costume, which looks really cute and embraceable. And first I was going to @home cafe, probably the most renowned maid cafe in the world, but I got a flyer from maids from Maidreamin. I think Maidreamin is coming to Los Angeles sometime soon? Or it’s just a rumor? And the other maids with Samurai or kimono outfit were passing flyers, so there was a severe competition among maid cafes, yes, even maid cafes are run by capitalism in Japan. Also, I noticed a four eyed girl (meganekko) with heavily pinned Attack On Titan batches was passing fliers. So, I had a little chat with her, and she said she was a big fan of Levi. So she had a lot of Levi batches attached to her outfit and purse. But I didn’t find any Mikasa or Krista batches. So, I told her, “I’m a fan of Krista.” And she grinned and instantly told me, “Oh, so you wanna marry her!” Then, I bursted into laughter and told her, “Ohhh, you totally know! LOL.” Yes, she looked cute, it would instantly killed a meganekko-moe otaku, but the way she spoke was very nerdy, or very otaku. Normally, people wait until other person gets to finish the sentence, but she didn’t read the atmosphere and went ahead and kept going blurting her own interests with so much passion in it! And so fast paced. Yup, very otaku! I loved it! 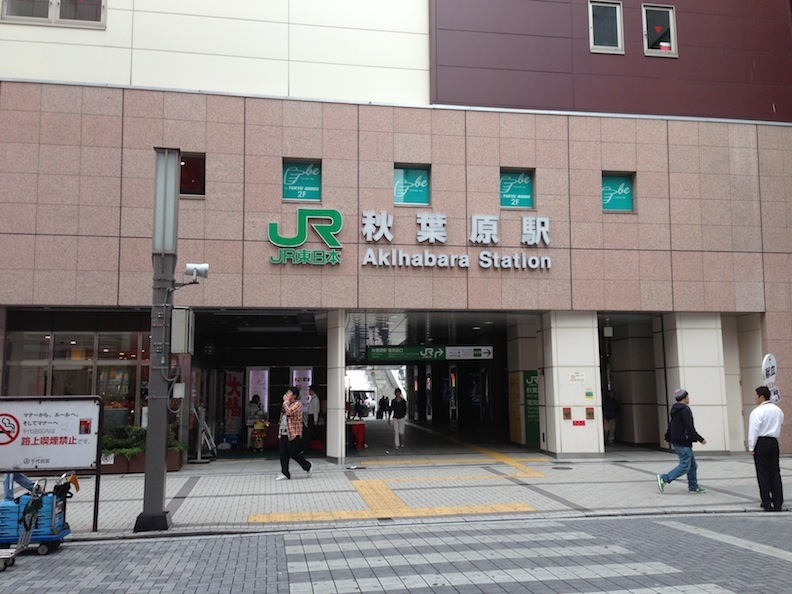 This was really Akiba! But, I didn’t go to her cafe. Because there was one maid before that I couldn’t take off my head. When I got a flier from her, I told her, “No, I can’t go, I have somewhere else to go to.” But she was like, “Really? Are you not coming to our cafe…?” with a sad face and a very fragile voice. I was like, “Oh, my Gooooooood!” After that, I got a short term memory loss, wandered around a little bit talking to other maids on the street, and by the time I realized, I was inside the cafe that a sad looking face maid was working at. Yes, I think it was Maidreamin. But their service wasn’t that different from maid cafes at American anime cons. They got dance and music performance, janken-pon and game, and take pictures with a maid with some additional fees. But what is the difference? The Japanese maids kneeled down at my table and address me as Goshujin-sama (master)!!! I suddenly got a breathing problem, and almost choked myself. That kneeling down gesture, ughu, my head exploded. Oh yes! THis is what I have been wanting for such a long time since I watched Mahoromatics! The pleasure of being recognized as Master, this totally makes me “overman” or superman advocated by Nietzsche as Master Morality! The sweet pronunciation and sound articulated by the cute lips of a maid was just amazingly holistic. It’s not fake, not phony, it’s real, the real pronunciation of Goshujin-sama~! And with that high-pitched kawaii voice, and also a smile that welcomes todos, not only us kimo-ota, but also all kinds of sentient beings! Yes, just like that song by Yanase Takashi, the author of a kids’ anime Anpan-man, we all are living! Even trees and mountains! Too bad the genius Yanase Takashi passed away recently, but anyway, the maid’s smile was so welcoming. So, I took a picture with her doing a cat pose. Kekeke. Buhiiii!!! But darn, when I checked the bill that the maid slipped in, $40! It popped my eyes! The other maid cafe I went was Cure Maid. Here, a maid at reception didn’t address me as “Goshujin-sama.” I was like, “What a hell?” So, I felt something was wrong, “Is this really a maid cafe?” A maid came to my table, but she didn’t address me as “goshujin-sama” either. So, I asked,”What kind of service do you provide?” She said this was supposed to be a tea station, not really a maid cafe. No picture, no game, no goshujin-sama, no one-to-one conversation. And no “moe moe kyun” when passing cake to me. But how come they are still wearing a maid costume then? So, it’s still a cosplay cafe. And the way they spoke was too formal and slow, almost like aristocratic way of speaking, which I never heard in real life. I tried to pace up, so I speeded up a manner of speech, but the maid kept her conversation pace to herself, didn’t change to a customer’s speed. No adjustment whatsoever! What kind of customer service was this? You make me adjust to your speed? So, I was pretty frustrated. They didn’t talk cute at all but some kind of conceited ojou-sama. They are maids, so they are supposed to talk like servants, how come they talk more upperclass than me? When did I become a lower class? Well, of course, I’m a working class guy or proletarian in real life, but still it didn’t make any sense. I’m supposed to be their master. As a matter of fact, they were introduced as a maid cafe on the website, so it was really off. So, I left this place with frustration. I couldn’t become Master in this cafe. But the price was reasonable, it was only $8. Yeah, no service other than serving tea and cake. So, it’s like Starbucks. But I think Starbucks was even better than this. They don’t talk more upperclass than me. American English is pretty egalitarian. And I thought Gen. MacArthur has ended all these aristocracy BS in 1945. So I didn’t enjoy this cafe at all. So, I didn’t get to have Master Morality but rather Slave Morality. Previous PostNYCC 2013: Con ReflectionsNext PostNagi No Asukara 5, renounce love, Seitei Souther! 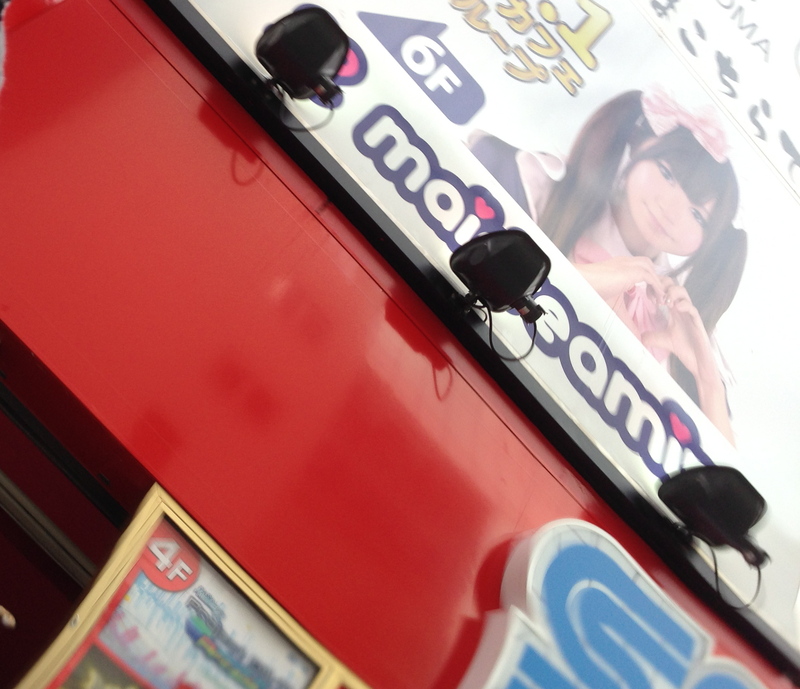 Come to Akiba next time! I think they got English-speaking maids at @home cafe in the Don Quixote building. haha, I totally felt the moe while reading this :3. A humorous and heartwarming look at the context in which maid cafe transactions take place. Thank you, Monsieur LaMoe! Thanks, Mori. Maidology report from Akiba! Ooh, nice, sounds similar to my experience at Butler Cafes, I went to two around Ikebukuro and Harujuku, and one of them after my friend asked allowed us to take photos of place servings. So Butler Cafes are not in Akiba? Ikebukkuro and Harajuku are very fashion modern place, very remote from otaku mecca. Hmm.. i know of three butler cafes, and yes they are not located in Akiba. Not to draw away fro. otaku meccha, but Otome Road is at Ikebukuro rather than Akihabara. Oh I see. Otome Road, mecca for fujoshi, LOL! While I was in the cafe, we ordered some food: nachos and a chicken basket. We also ordered some drinks. One thing you should know is that people don’t go to maid cafes for the food! It is the WORST food you’ll probably eat, especially for the price. For the four of us, we paid about $74.00 USD for crummy food. The nachos were microwaved and tasted stale while the amount could fit into my palm. The chicken was also microwaved and soggy. Also, depending on how long you stay, you are charged. Some cafes will charge you every 15-30 minutes and others by the hour. It’s not cheap either, so be prepared! Thank God we got out of there around 30 minutes, but I believe we got charged another $5.00 each just for being there a couple minutes longer (times that by four). I was shocked to see that one item cost nearly $380.00! Depending on what you order, the maid will “cast a spell” on your food (pretend, of course) or entertain you. I wasn’t sure what this entertainment entailed until I noticed a maid do a child-like dance for a customer where she sang and rubbed a stuffed animal on a man’s leg. I also saw a man being fed. It seemed like men would tell the maid to eat something they ordered too unless this was a part of the act. I’m really not sure, but it was unique. A maid cast a spell on my sister’s drink, swirling her coffee with the words “make it good!” As a male, if you are into this type of thing, you may enjoy the attention of maids at a maid cafe. However, some of you may feel uncomfortable and uneasy, as you watch men being babied by maids in the most unusual ways while you sit awkwardly at your table eating the worst, most over-priced food – ever. It all depends on your perspective and your reason for being there. I don’t like to be babied, that’s not what Master will ask maids to do. Because maid cafe is a place to be Master, so I expect them to treat me as their Master, not as babies, and I order them to serve me since they are my servants during the assigned hours. They kneel down and call you “goshujin-sama (Master).” And that is the upmost service of maid cafe where it provides Master Morality. I think most people are proletarians like me, and especially otaku like me that are girl-less and no skinship, only few are business leaders or political leaders who can built their own harem, so in real life (3D) we are living on Slave Morality. So, it’s a virtual place to become Master, and that’s the ultimate purpose of going to maid cafe. I think food and beverage wise, Cure Maid was the best, they got the best tea and cake. But the maid service was poor, they didn’t treat me as Master. I didn’t go for food and drinks but for maids. So, as a maid cafe, Cure Maid was unqualified IMO.